Duraglide is a premium vinyl-acrylic exterior and interior flat. This product has excellent touch-up, outstanding hide and good washability characteristics. Duraglide offers good color retention & adhesion and is designed for use on all interior drywall and exterior and interior masonry surfaces. 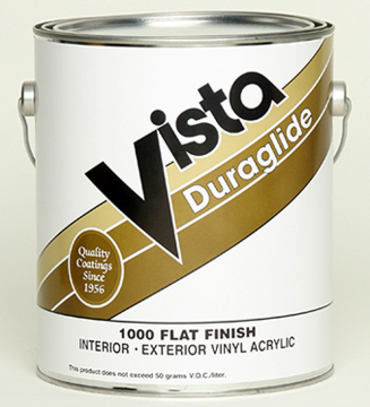 Recommended Uses: Properly primed drywall, concrete, masonry, stucco, plaster and metal. NOT recommended for use on exterior wood. Colors: White and stock colors. Custom colors to order.